The range of Bicycle Pedals is supplied by us with the appropriate quality and testing standards to achieve the desired goal. These pedals consist of a spindle that thread into the end of the crank which enhance the working efficiency of the pedals. Further, they rotate freely on the ball bearings with respect to the spindle and are admired for their robust design and durability. 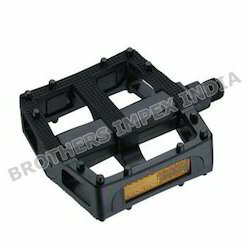 It is mechanical interface between foot & crank arm. The National Cycle & Motor Co.